If you are in the most competitive market place there is you need an Ioline FlexJet™ EX-II inkjet printer. It has some of the lowest operating costs of any inkjet printer plotter on the market today. 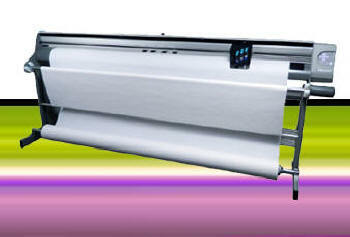 Its a large format plotter that supports ultra wide plotting all the way up to 2.2m in width. The Ioline FlexJet E-II does not suffer from slower printing because the plot density is higher... in fact the speed does not slow at all. This reduces costs of manufacture when making complex detailed or heavily annotated markers. No matter what the job now you can enjoy and benefit from output speeds of up to 155 square meters per hour! Costs only £0.20 / 100 square yards—compared to over £2.00 for other inkjet brands. Maintaining the FlexJet E™ is as easy as keeping it clean. Wipe paper dust off the traverse and brush the drive shaft from time to time. For more in-depth information please check the FlexJet E-II Series or contact Ioline UK and Europe or call 01782 544700 for more information.